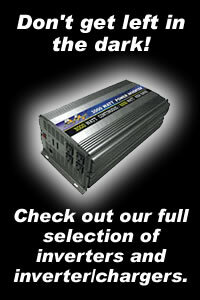 Xpressbatteries.com is pleased to provide one of the largest selections of DC to AC inverters available anywhere on the internet. Ranging in sizes from under 400 watts all the way to 6000 watts, our selection of inverters will certainly fit your portable power needs. Perfect for solar systems, emergency backup, and some include built in chargers for stand alone systems.